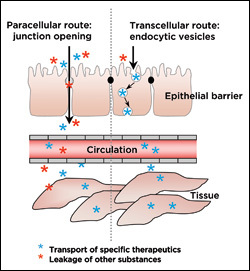 Transport of therapeutics across gastrointestinal (GI) epithelial cells to reach the circulation can be achieved via the paracellular route by inducing opening of the cell junctions (left side of illustration). However, this may result in detrimental side effects due to the unintended transport of other substances present in the GI. 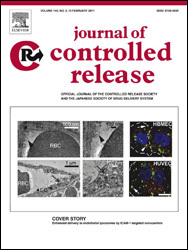 Muro and Ghaffarian’s method (right side of illustration) provides an alternative strategy: drugs are loaded in nanocarrier particles that are targeted to cell surface receptors that control transport across the GI epithelial cells, providing a safe avenue to reach the circulation without opening the cells' junctions. 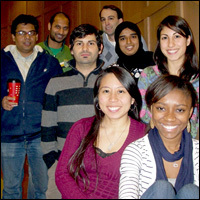 Fischell Department of Bioengineering graduate student Rasa Ghaffarian, advised by Assistant Professor Silvia Muro (joint, Institute for Bioscience and Biotechnology Research [IBBR]), won the Best Poster Award at the third annual meeting of the American Society of Nanomedicine, held in Shady Grove, Md. in November 2011. Ghaffarian took top honors for the presentation of her work on a safer method of transporting drugs across the epithelial barrier lining the gastrointestinal (GI) tract. 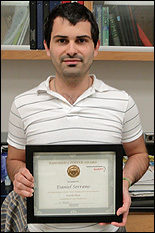 In April 2011, Ghaffarian and Muro received the University of Maryland Office of Technology and Commercialization's Invention of the Year award in the Life Sciences category for their work in this area, which described how drug nanocarriers that target a protein found in the epithelial cells of the GI tract, ICAM-1, can prompt the cells to take up (ingest) and move the drugs using their natural vesicular transport mechanisms rather than using the more common method of forcing therapeutics through the junctions between them. This transport mechanism was observed to be safer than the intercellular junction route, which can allow other undesired molecules to pass through at the same time because it is like an unguarded door that doesn't "check ID." At the conference, Ghaffarian presented advances in the project that describe how vesicular transport is regulated by a unique mechanism found to be distinct from other vesicular pathways previously described. 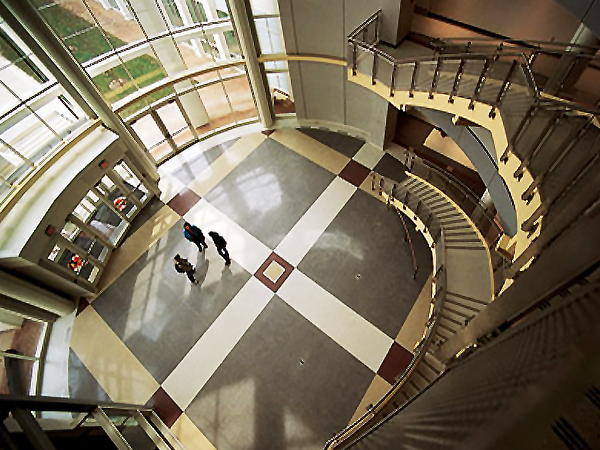 This discovery, says Muro, will further guide her group's optimization and manipulation of the transport pathway to improve drug delivery across the GI tract. 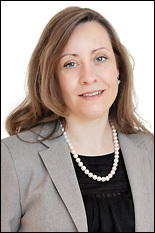 Ghaffarian says she's excited about these recent results. 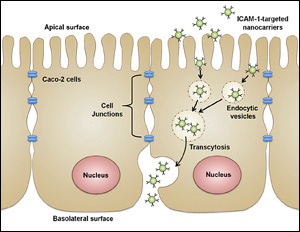 "ICAM-1-targeting not only provides a safe avenue for therapeutics to cross the GI epithelium, but it also utilizes an innate mechanism of transport that has yet to be characterized," she explains. "The nature of vesicular, transcellular transport in general is not very well understood by the scientific community, so further characterization will allow us to exploit this pathway for drug delivery purposes as well as provide extremely valuable insight for fundamental cell biology." 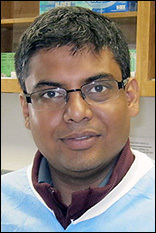 Ghaffarian's poster was co-authored with Muro and fellow Muro Group member, IBBR postdoctoral research associate Tridib Bhowmick.